I recently had the good fortune of discovering a new species of mite that looks bizarre enough to be no less suitable for science fiction than science reality. Luckier still, collecting it did not require an arduous and intrepid journey across hostile terrain to reach the location. I simply walked across the road from my workplace and fetched a soil sample from a neglected lot on the Ohio State University campus. The event was as lackluster as it was serendipitous. The new species has a worm-like form that makes it immediately apparent that it belongs to the Nematalycidae — an enigmatic family of mites that are sometimes mistaken for nematodes. But the presence of long and unbranched body setae (hairs) readily distinguishes it from the four previously described species of nematalycids. Given how little we know about this family, I did not hesitate to accept an invitation from my collaborators, Ronald Ochoa and Gary Bauchan, to use their high-tech facilities at the Beltsville Agricultural Research Center in Maryland in order to examine and describe Osperalycus tenerphagus — the first species and genus of Nematalycidae to be described in 40 years. Osperalycus tenerphagus — Protonymph (top) and tritonymph (bottom). We used a low-temperature scanning electron microscope (LT-SEM) to image O. tenerphagus. This is the obvious choice of equipment for a mite such as this. The soft and flexible integument of the Nematalycidae makes them more vulnerable than most other mites to shriveling up inside the vacuum of a conventional SEM. LT-SEM overcomes this obstacle by freezing the specimen in liquid nitrogen. We were thrilled with the results — we had obtained micrographs that showed off a species of this peculiar family in all of its exquisite detail. Some of our colleagues have independently remarked upon the dragon-like appearance of O. tenerphagus, although enthusiasts of the medieval European fantasy genre may fail to see the likeness. The European dragon is after all a winged creature that hardly resembles anything that is worm-like in appearance. However, the traditional Chinese dragon is indeed a wingless serpentine creature that bears a clear resemblance to this mite. The observation seems all the more appropriate when you consider how the integument is also reminiscent of that mythical beast’s scaly armored skin. Fortunately, the resemblance does not extend to fire breathing. Osperalycus tenerphagus — Close-up view of extended (left) and contracted (right) integument. The integument is probably the most distinct and unusual feature of the Nematalycidae because it can extend and contract, much like that of an actual worm. It is divided into a series of annular ridges; when it contracts, the plate-like structures that line these ridges interdigitate. The contraction of the integument is driven by longitudinal muscles, whereas the extension is powered by a combination of elastic energy and hydraulic pressure. 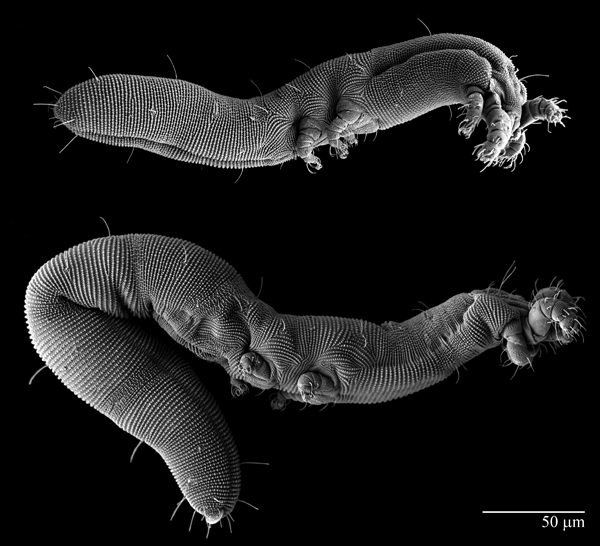 Exactly how these mites evolved this distinct way of moving around is a mystery. Osperalycus tenerphagus also revealed another surprising feature under LT-SEM. It has a soft and transparent vessel (which is invisible under a light microscope) into which the chelicerae slot. The vessel may provide a very unusual way of feeding on small microorganisms. It appears to enable the mite to hold a microorganism in place while the chelicerae are used to rupture it. The mite, a fluid feeder, would then be able to imbibe the fluid that is spilled out of the microorganism. The strange mouthpart morphology of O. tenerphagus is the basis for the binomial name. “Ospera” means “mouth bag/purse,” which refers to the soft vessel. “Tenerphagus” is a reference to the tender feeding mechanism that has been hypothesized for this mite — it has a specially modified palp that appears to be used for delicately picking up microorganisms in order to avoid bursting them until they are inside the vessel. Samuel Bolton is currently a PhD student at the Acarology Lab at Ohio State University. He has just completed a pre-doctoral Smithsonian Fellowship based at the Beltsville Agricultural Research Center in Maryland. His research is largely based on the evolution and systematics of the Endeostigmata (including the Nematalycidae) — an extremely ancient and basal group of mites that dates back to the Devonian.